Connection: Provides a connection used to communicate with the data source. DataAdapter: A bridge used to transfer data between a Data source and a DataSet object. DataSet: Stores query result from DataAdapter. On this post, you will see how to develop an ASP.NET web application that query data from SQL Server 2005 and display the result on a GridView object. I have provided both VB.NET and C# programming languages. Create a connection string in web.config. I decide to put the connection string in web.config so that I can re-use the connection string in other web form. name: A connection string name. connectionString: A connection string which is used to connect to a database. On this example, it connects to Northwind database on BKKSQL001\INSTANCE01. providerName: A provider name that is used. On a Web Form, imports some namespaces which are required for working with SQL Server. 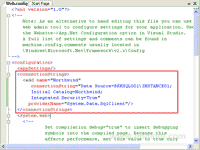 System.Web.Configuration is use to read values from web.config. Use a GridView object to display the query result. Set the name of GridView to “gridView1“. Copy and paste the code below to Page_Load method. Dim sqlProducts As String = "SELECT ProductID, ProductName, UnitPrice FROM Products"
Line 4-6: Get a connection string value from web.config. 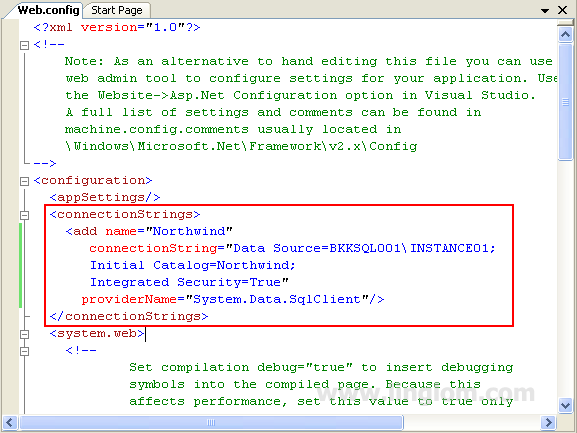 Then, open a connection using the connection string to a SQL Server. 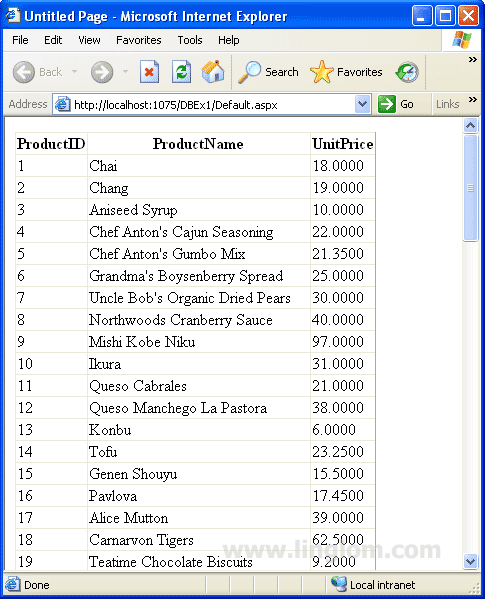 Line 8: Create a variable “sqlProducts” which stores SQL query from Products table. Line 10-12: Create a SqlDataAdapter object “da” to execute the query. 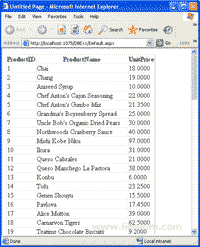 Then, create a DataSet object “ds” to hold the result from object “da” and set name to “Products“. Line 14-15: Display data from object “ds” on a GridView object “gridView1“. Run the project. You will see the result as figure below.